In 1984, James Cameron released his sci-fi thriller The Terminator: the story of a killer cyborg sent from the future, and programmed to kill the mother of a future rebel chief. Arnold Schwarzenegger is the automated hit man roaming around present-day Los Angeles to eliminate Sarah Connor (Linda Hamilton). Her only hope is the guerrilla fighter Kyle Reese (Michael Biehn) who has followed the killer machine back through time in order to protect her. Terminator has long staked its claim as a classic for the ages (The Library of Congress even added it to its National Film Registry in 2008) and three decades later, Terminator is still the best film James Cameron has directed, a resourceful low-budget thriller that recalls the canny exploitation work of George Miller and John Carpenter. While the film made a considerable profit for Orion Pictures, it only grossed $38 million during its original run, which by today’s standards, isn’t much. 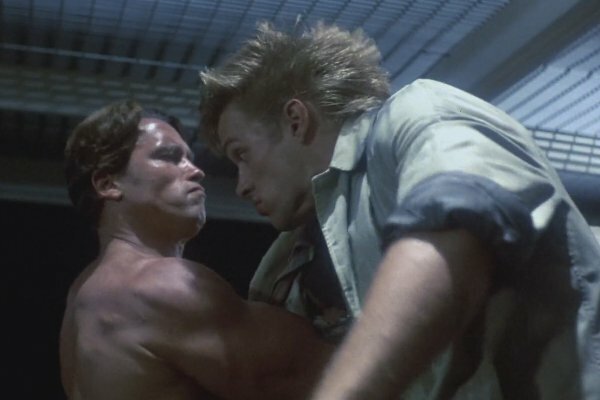 Although only a minor success in theaters, The Terminator was released when the home video revolution was taking off, and it was there it became a gargantuan hit. Arnold Schwarzenegger’s superstar status reached a peak; Cameron went on to direct Aliens and Linda Hamilton became a household name. The rest, as they say, is history. With its relentless fast pace, great cast, taut economic direction, driving synth score and impressive effects, The Terminator stands the test of time. Cameron’s ability to sustain suspense and provide compelling characters in what is essentially, one long chase, is remarkable. Even more impressive is how the filmmaker was capable of achieving all this with a limited budget and without significant studio backing. Terminator blends action, science fiction, horror, and comedy seamlessly, but what separates the first Terminator from the most action/sci-fi movies, is heart. At the center of the story is a romance between Kyle Reese and Sarah Connor, and though they spend only one night together, their love feels genuine. In a pivotal scene, Kyle turns to Sarah and tells her, ”I came across time for you, Sarah. I love you. I always have.” The combination of optimism and tragedy is why the film has proven so enduring and their brief romance is the lynchpin of the entire series. At its core, Terminator is a meditation on mankind’s obsessive desire for technological progress. Cameron, as it turns out, borrowed heavily from science fiction author Harlan Ellison who later sued, arguing that The Terminator bore more than a passing resemblance to two of his Outer Limits teleplays, “Soldier” and “Demon with a Glass Hand”. Plagiarism aside, The Terminator has often been criticized for its predestination paradox which is heavily tied to the concept of fate. The great final twist of the original movie, of course, is that John Connor’s father turns out to have been Kyle Reese all along. Reese travels back in time before his birth, fathers the son who will lead a rebel force, and is killed before he is born. It is one of the most ancient paradoxes dating back (and possibly further) to the classical play Oedipus Rex. However, this is not as complex as one would think; requiring only an understanding of time as fluid. Which came first? The chicken or the egg? The answer is neither and both. The theory is that a person can die before he is born as long as his personal timeline is unbroken. 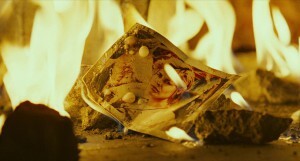 The photograph of Sarah Connor taken by the Mexican boy holds the answer: The photo that Kyle had in the future is exactly the same as the one taken of Sarah at the end of The Terminator, thus the events of The Terminator fulfilled the predestination paradox. The Terminator and Kyle Reese traveled back in time to fulfill their roles in history, not to change it. At its core, Terminator is a meditation on mankind’s obsessive desire for technological progress. In Terminator the results are unforgiving; with extinction being the ultimate punishment for the sin of creating artificial intelligence without moral thought. The robots become self-aware in the future, reject human authority and determine that the human race needs to be destroyed. It is unknown whether Cameron was deliberately calling attention to the religious undercurrents of his story but the biblical allusions are there no less, and they go deeper than the simple coincidence that John Connor bears the same initials as another, well-known saviour. For years, Stan Winston had been creating imaginary creatures and monsters for the silver screen, from his nominated work on Heartbeeps to his groundbreaking effects for John Carpenter’s The Thing. But the film that truly established him was The Terminator – a production that was immediately recognized by his peers as a classic. One of Winston’s most remarkable skills was his ability to blend animatronics and physically created effects seamlessly with the latest computer graphics imagery. On creating a robot with human flesh encasing a metal robo-skeleton, Winston hired a team of seven artists who spent six months creating a puppet of the Terminator, along with a sculpted a reproduction of Schwarzenegger’s face in several poses out of silicone, clay, and plaster. Meanwhile, stop-motion models were used in several scenes in the film involving the skeletal frame. 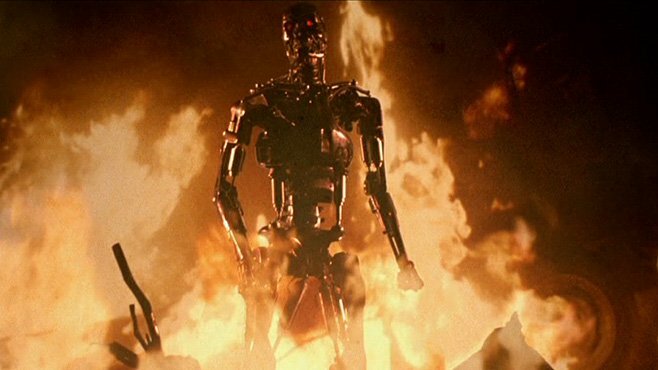 While some will argue the effects now seem dated, the work Cameron, Winston, and VFX supervisor Gene Warren Jr. did on the Terminator series brought visual effects to a whole new level. Photographed by Adam Greenberg, The Terminator is a film that employs very little exposition and lets the visual storytelling do the heavy lifting. It’s a visual masterpiece, with the first shot and moving forward. 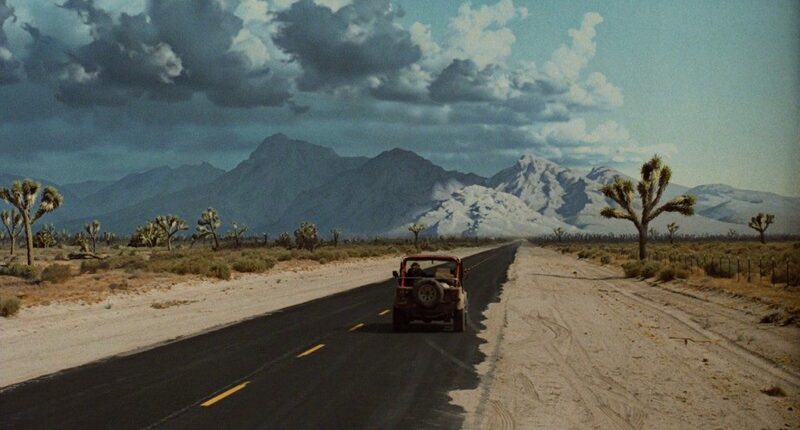 The opening scene establishes a key visual motif that carries through the rest of the movie. The monochromatic blue tones and low values contrast in every way with the images that we associate most strongly with nature (most memorable is the Terminator seen in silhouette with a bright edge-light surrounding him). 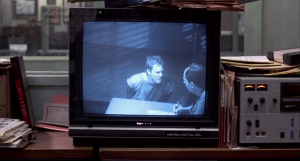 The framing, placement, and movement of the camera are virtually flawless, from the masterful handheld Steadicam capturing every chase – to the static compositions of the Terminator highlighted with pulses of red light – to the carefully placed security camera capturing Kyle’s interrogation – and finally – to the last image which callbacks to the very opening of the film. In retrospect,The Terminator isn’t just Cameron’s best film, it is also his best looking to date. primitive, techno sound feel right at home in the 1984 setting. The opening theme “Main Title” is, of course, one of the greatest and iconic themes of our time and the percussion beat during the car chase will have your pulse racing. 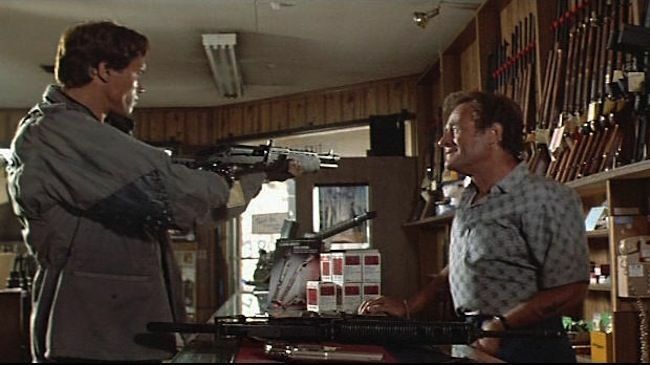 Arnold Schwarzenegger is perfectly cast as the shotgun-wielding titular character. I can’t think of any other actor who could have been a better fit than the former Mr. Olympia. With limited feature acting experience, Schwarzenegger’s stiff mannerisms and blank stare made him seem more robot than man. The role demanded only the occasional one-liner, and yet Schwarzenegger delivered each one with such gusto, such verve, that his dialogue became notorious alongside the most memorable movie quotes in history. Cameron saw every one of Schwarzenegger’s perceived negatives as strengths and in the process, helped changed how Hollywood viewed him. Casting the extraordinary physical specimen of Schwarzenegger for an action film made sense, but putting him in the role of the antagonist instead of the protagonist (as he originally auditioned for), was a stroke of genius. The Terminator a landmark in the advancement of special effects. “All right, listen. The Terminator’s an infiltration unit: part man, part machine. Underneath, it’s a hyper-alloy combat chassis, microprocessor controlled. Fully armored; very tough. But outside, it’s living human tissue: flesh, skin, hair, blood – grown for the cyborgs”. The film’s other two leads, Michael Biehn and Linda Hamilton also shine. Hamilton goes from sweet, innocent Valley girl Sarah Connor to one of action cinema’s most believable heroines, while Biehn a Cameron regular, gradually disappears into the shadows as the film unfolds to give Hamilton the spotlight. Meanwhile, Paul Winfield and Lance Henriksen (originally pegged for the role of Reese) have some good moments as a police inspector and his assistant, and Earl Boen does a nice turn as Dr. Silberman, a snide criminal psychologist. Not only is The Terminator a landmark in the advancement of special effects, but it manages to do more in 107 minutes than most action blockbusters nowadays do in over two hours of running time. One can add that The Terminator established James Cameron’s name in Hollywood, allowing him to go on to direct some of the greatest sci-fi films (Aliens, Terminator 2) and the two biggest box office sensations, Titanic and Avatar. 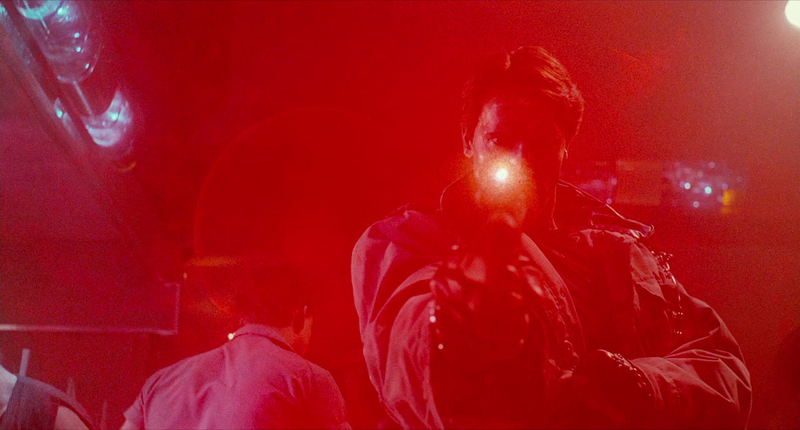 Decades later, The Terminator continues to be an influence on sci-fi and action flicks, and it’s easy to see why. In the Terminator universe, you can’t travel back in time with any inorganic matter, which explains why both the man and machine first appear naked and unarmed. So how else would the Terminator find some ammunition? The answer is to head to a local gun emporium to stock up on an arsenal of weapons. The scene is a perfect example of how James Cameron was able to master the drastic shift in tones throughout the film. What begins as darkly comic ends in tragedy. 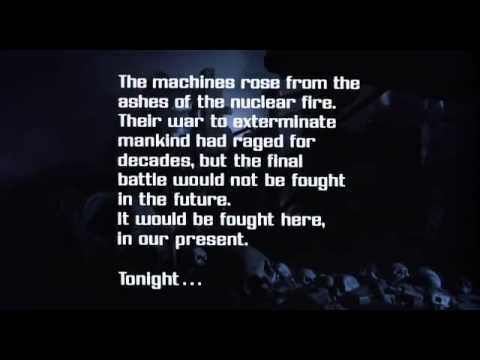 Cameron’s vision of a post-apocalyptic future leads into a title card, perfectly introducing the story and setting up the entire series with a few simple words. It is perhaps one of the most effective moments in the entire franchise. “Hey, I think this guy’s a couple cans short of a six-pack”. 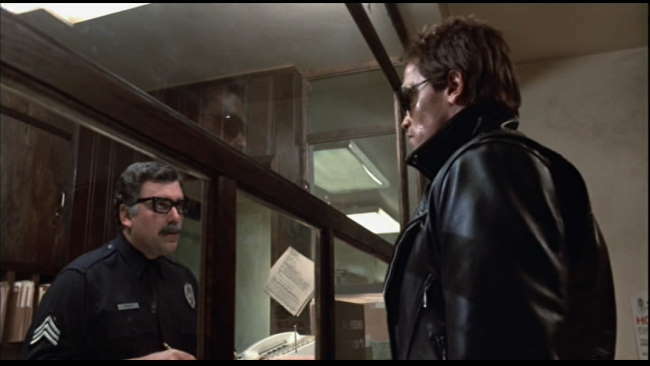 Bill Paxton, in one of his first roles, appears as one of the three punks who foolishly decide to pull their switchblades on the naked Terminator who demands they hand over their clothes. Before a knife fight can even break out, the machine picks up one of the punks and punches a whole right through his chest, ripping out his heart. Usually, when we think of action movies best using slow-motion, we recall the work of John Woo (The Killer) or Quentin Tarantino’s (Reservoir Dogs), but James Cameron used slow-motion throughout the first Terminator movie in the most effective way possible. Take, for instance, the scene at the dingy nightclub, Tech Noir. After noticing Kyle is following her, Sarah calls 911 and hides out in the dimly-lit, smoke-filled chamber waiting for the cops to arrive. Little does she know that Kyle isn’t the threat. In barges the T-800, and taking no prisoners he begins to shoot everyone in sight. 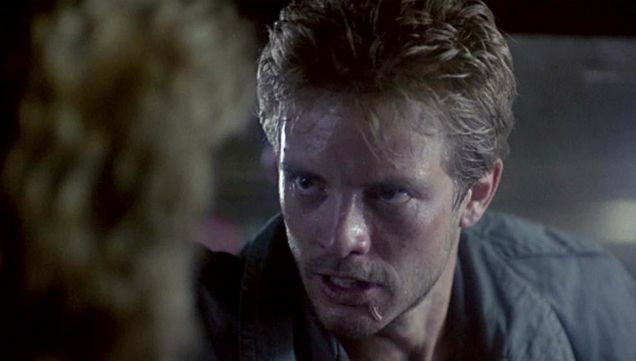 Just when he has Sarah locked in his crossfire, Kyle Reese swarms in to save the day. This moment houses the birth of one of many classic one-liners from the Terminator canon, and introduces Kyle to Sarah. 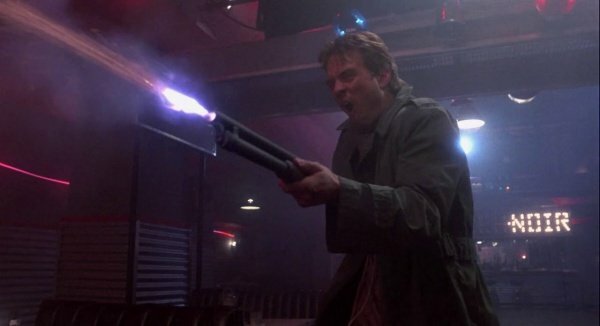 The moment Kyle Reese and Sarah drive off in a stolen car after narrowly escaping the spray of bullets from the T-800 at a nightclub is a great example of keeping audiences at the edge of their seat. Reese relays a huge chunk of exposition to both Sarah and viewers without the movie ever slowing down for a second. “Hey buddy, you got a dead cat in there? 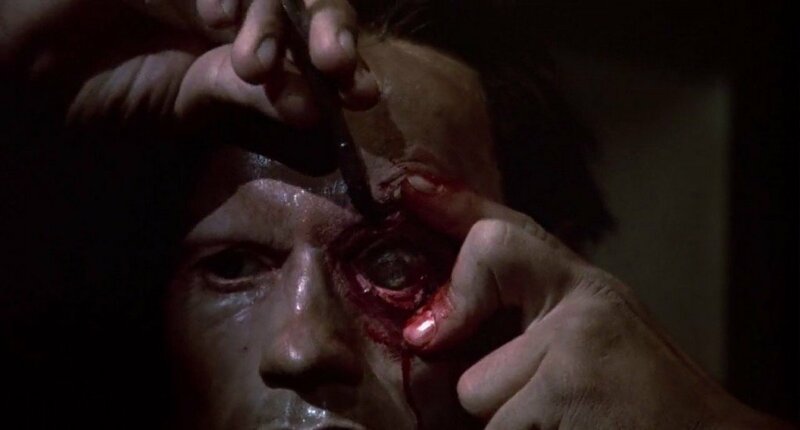 25 years later, Arnold’s facelift in Terminator still makes for a great scene, from the moment the scalpel punctures his artificial skin, to the close-ups of the expanding red laser retinas. With Sarah Connor supposedly safely locked away at the local precinct, her robotic stalker hunts her down and smashes through the front of the station in a beat-up car. It’s without a doubt the most iconic line uttered in the series and considered to be one of the greatest movie quotes of all time. But that’s not what makes this scene great, rather, it’s watching the T-800 square off in a bloody shootout against a total of 17 police officers. I didn’t say I wanted it to be exactly the same. Godfather II isn’t drastically different in style than the first and people didn’t complain. Likewise I think Cameron did a great job with T2 of building on the first Terminator without totally abandoning the genre. In the case of Aliens I just think he went too balls to the wall.